Actress Alysia Reiner in Nicole Miller and famous designer Carmen Marc Valvo in his own designs. 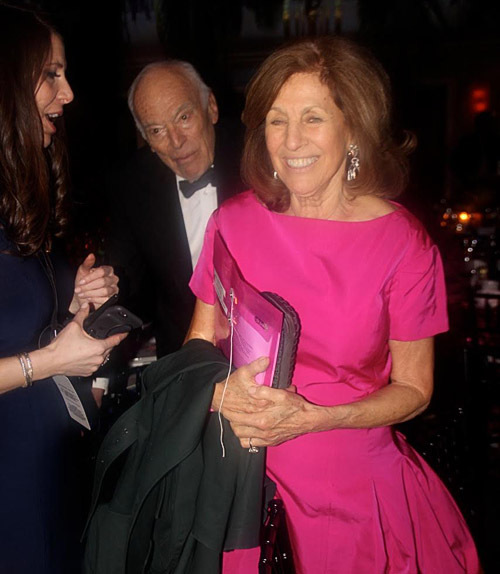 Business mogul Leonard Lauder and wife Judy. Elizabeth Hurley and Elton John. Famous litigator Tom Duffy, breast cancer survivor and board member Mary Bryant McCourt, and philanthropists and board members Jane and Joe Pontarelli. TV personality Jill Martin wearing Juan Carlos Obando and celebrity and animal activist Beth Ostrosky Stern (wife of Howard). 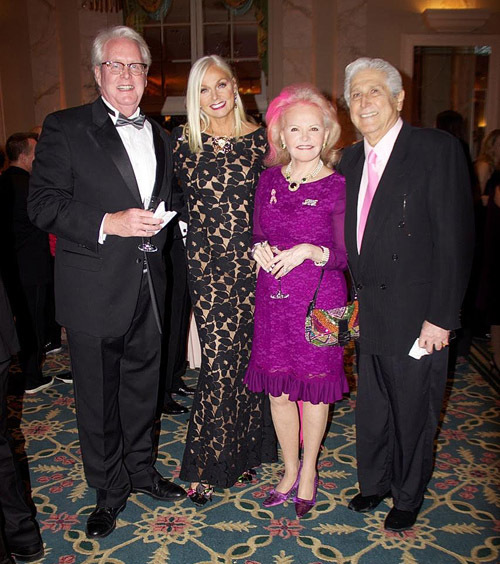 The Breast Cancer Research Foundation (BCRF) held its annual dinner to a sold-out crowd at the Waldorf Astoria with over 1,200 people attending and more than $6 million raised. The “Hot Pink Party” with a jungle theme added tables to a second balcony to accommodate the guest list which included: John Demsey, Katie Lee Joel, Beth Ostrosky Stern, Alysia Reiner, Aviva Drescher, Elizabeth Hurley, Jill Martin, Cynthia Rowley, Nigel and Cristen Barker, Carmen Marc Valvo, Donna Karan, Jim Coleman and Cynthia Ott, the Lauders and so many others. The BCRF was founded in 1993 by Evelyn Lauder and since then has raised more than half a billion dollars for lifesaving research. The organization seeks out the brightest minds in science and medicine giving them the resources to pursue their best ideas. In 2015-16 BCRF will award $48.5 million to over 240 scientists from top universities and medical institutions. This event is one of the great “happenings” of the year and I went to purchase a hot pink gown in order to abide by the dress “code.” Excitedly anticipating this evening for the past couple of weeks, I was wondering if it would live up to my expectations. This year was a smash hit outdoing all the others with a palpable energy that was felt on the sidewalk of the Waldorf as I exited my taxi cab. Firstly, I bumped into designer Carmen Marc Valvo who was wearing one of his own cool ensembles with black sneaker accompaniment. The theme this year was “Jungle” and they had women and men dressed in jungle attire dancing in front of the Waldorf Astoria-not too shabby. As I headed to the cocktail party which started ‪at 7PM‬, it was teeming with people in gowns, tuxedos and edgy attire. Aviva Drescher, a former “Housewife”, was wearing Carmen Marc Valvo, and said this year’s Housewife show was “fun and pleasing.” Drescher looks incredibly fit and healthy which she attributes to her rigorous exercise regimen and an alkaline diet. She is classy and intelligent and noted that the Housewives ratings have been down. As the crowd kept expanding, I was introduced to Julie Gralow, a medical oncologist who has been a recipient of funds from the BCRF for the past 15 years and noted they are one of the great organizations because they “pick researchers and not research” allowing the scientists to do their own magic. Speaking of magic, there were so many beautiful ladies such as Ulla Parker in Zuhair Murad, Elizabeth Roberts in Lanvin, Alysia Reiner in Nicole Miller, and Cristen Barker (wife of Nigel) in Pamela Roland who elevated the night to a “wow” they were only outshone by the jungle decor which was nothing short of spectacular. The Waldorf ballroom was resplendent in trees and sequined tablecloths; even the napkins were perfection: wrapped in menus which contained jungle designs. This event was meticulously planned and extravagantly orchestrated with significant attention to detail. As the guests reluctantly headed to the ballroom, we were greeted by jungle dancers and a pink-gowned Elizabeth Hurley who said Evelyn Lauder, who died from breast cancer in 2011, would have loved to attend and been proud that this is the largest private funder of breast cancer research in the world. Hurley noted that 91 cents out of every dollar raised goes to research!! Every 74 seconds someone dies of breast cancer-a sobering statistic. This year it was announced that the Woman’s Cancer Research Fund (WCRF) and BCRF were joining forces, with a video shown of Tom Hanks, whose wife Rita was diagnosed in 2015, declaring “if we can put people on the moon then we can cure cancer.” One thing that may be harder then curing cancer is getting tickets to the Vanity Fair Oscar party and Elizabeth Hurley announced that for the first time Graydon Carter had donated two tickets to be raffled off. A public auction was then held with millions being raised and Roz Goldstein who founded the “Unsung Award” after being diagnosed with breast cancer 11 years ago, presented Gail Hilson to introduce Melinda Blinken who was being honored with the award. 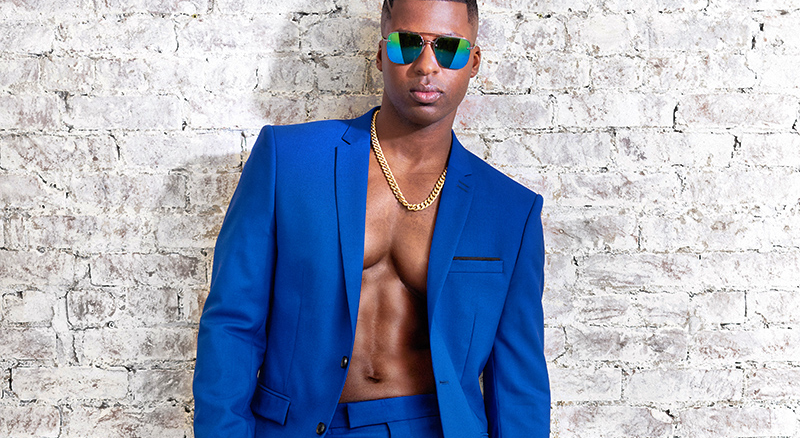 Hilson, clad in a stunning gold Givenchy, said that three of her four siblings possessed the breast cancer gene mutation, were later diagnosed with breast cancer and are now cancer free. Hilson went on to praise Blinken as her hero because she survived a 30-year-old ovarian cancer diagnosis and has given compassion and support to many others. As Melinda Blinken, whose husband is the US Ambassador to Belgium, took the stage in a 30-year-old pink Pauline Trigere dress, she gave a one-minute speech exclaiming this award should have been given to her good friend Evelyn Lauder. Blinken later told me that “ovarian cancer was the best thing that ever happened to her” because it forced her to be strong for everyone-a remarkable statement. It was time for some Elton, and who better to introduce him then oncology luminary Dr. Larry Norton who said the answer to cancer was in our own hands. He then proclaimed that Elton has helped raise the equivalent of 250 years of cancer research or $60 million with Hurley then reporting that a Leonard Lauder research grant in Elton’s name was being donated for perpetuity-a declaration that was accompanied by gold clad tap dancers who had the name Elton spelled on their jackets. Sir Elton, mourning the loss this past year of his best friend Ingrid Sischy from breast cancer, received ovation after ovation even inducing the elite, impassive crowd to their feet. Elton is 69-years-old and continues to astound with his flawless piano playing and crystal clear voice. His playlist was at least 8 songs long, ending with a “Circle of Life” and a roaring crowd that could not get enough. The night was a massive hit even to a jaded society crowd that attends 2 or 3 fundraisers a week. However it was all about the cancer survivors, bumping into Davina McNaney who was diagnosed with breast cancer three years ago and recently ran from Michigan to New York, a 15-day trip that spanned 467 miles, to raise awareness and money for research. As I exited the ballroom, I picked up my goody bag which contained cosmetics and lotions-savoring an evening that helps save lives and brings the hope of eradicating this scourge one step closer.